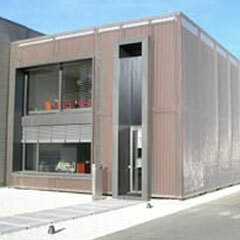 7.6M long elements of DOKA-BARRETTE 8914 provide sun protection to two elevations of the Innovation Forum. The HAVER tension profile & clevis screw fixing system was used to fix the mesh to the sub-structure. Elements of weave type EGLA-MONO 4631 are tensioned between the sub-structure of this beautiful contemporary building, to provide sun protection to the spaces within. To achieve a homogenous surface with only 25% open area, Haver & Boecker designed a new mesh specification using slightly crimped flat wires: LARGO-PLENUS 2022 made from Stainless Steel Type 316. 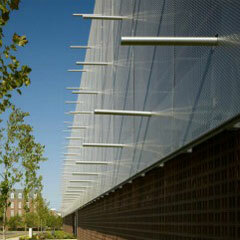 Small gaps between panels provide minimal interference for the integrity of the mesh facade. 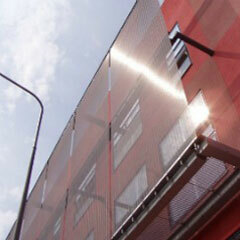 Weave type MULTI-BARRETTE 8101 is used to offer protection from driving rain to the external staircases. 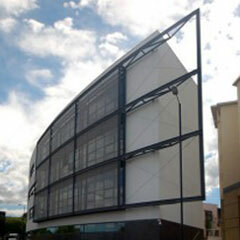 The design brief called for single length panels to span a height of over 8M, with no intermediate fixings. To achieve this, a new type of bottom fixing detail was designed and created by our sister company HAVER & BOECKER. Contemporary design using EGLA-MONO 4391, with an almost invisible bespoke fixing system to provide a stunning building facade. 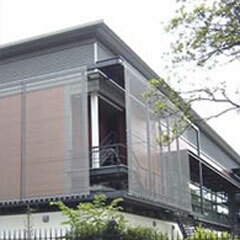 Depending on the viewing angle, the facade is sometimes dense or transparent.